FF Search Informer is the PUP that uses misleading techniques to prevent removal. Use Reimage to locate malicious components and get rid of them faster than with uninstall instructions. A full system scan blocks virus reappearance and prevents traffic to malicious domains. 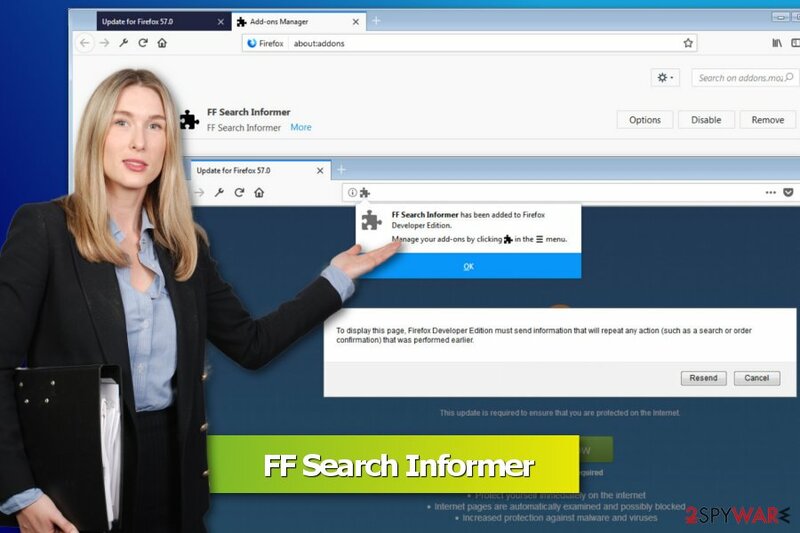 FF Search Informer is a highly questionable application that spreads as a fake Mozilla Firefox extension. Users might be redirected to this scam site by adware program or compromised website. Though, installing it is not recommended due to its aggressive advertising activities. FF Search Informer virus typically spreads as a useful extension or add-on in software bundles. After the infiltration, it might alter Firefox settings and display lots of ads, pop-ups, in-texts and similar commercial content on each website you visit. The website also delivers pop up telling that FF Search Informer was added to Firefox Developer Edition. Users are also asked to resend specific information by clicking a provided button. However, clicking any buttons on a corrupted website should not be done. As we have mentioned earlier, after the FF Search Informer hijack, the browser will be flooded with commercial content. You should not expect this potentially unwanted program (PUP) can get provide you any useful offers. Instead of that, your browser might crash due to excessive ads or at least you won’t be able to access a needed article without clicking banners. If you click on a commercial content provided by adware, you might have to deal with unpleasant FF Search Informer redirect problems. The ad-supported application might redirect you to websites that are designed to spread viruses or other cyber crimes. Thus, if you were ticked and installed this hazardous add-on, you have to get rid of it. You should be able to remove FF Search Informer as an ordinary Firefox extension. However, you should also make sure that any other suspicious applications were not installed on the system too. We have prepared manual FF Search Informer removal guide below. However, you can complete this task faster with Reimage or another reputable anti-malware program. 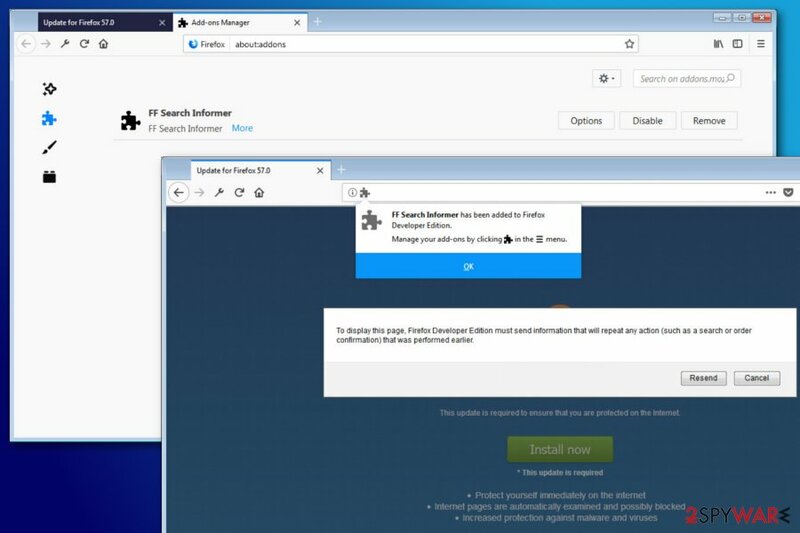 FF Search Informer is a shady add-on that targets Mozilla Firefox users. Adware and shady browser add-ons are usually included in software packages. Therefore, if you do not install programs correctly, you might find accidentally installed applications that diminish browsing experience and cause privacy-related issues. 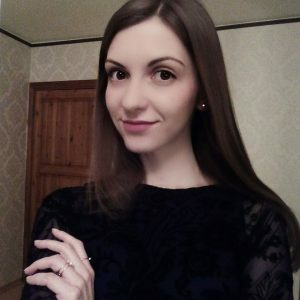 Specialists from bedynet.ru remind that Quick/Recommended/Standard settings do not openly disclose about third-party programs that might be attached to the primary application. However, if you choose these settings, you agree to install whole software bundle. First of all, you have to remove FF Search Informer extension via Firefox add-ons settings. If you see other extensions that you don’t remember installing, you have to get rid of them too. Once it’s done, you have to reset Firefox to delete tracking cookies and similar entries. The guidelines below will give more information on FF Search Informer removal. However, if they seem difficult or you just want a simpler solution, you can opt for automatic elimination. Here, look for FF Search Informer or any other recently installed suspicious programs. Wait until you see Applications folder and look for FF Search Informer or any other suspicious programs on it. Now right click on every of such entries and select Move to Trash. When in the new window, check Delete personal settings and select Reset again to complete FF Search Informer removal. Once these steps are finished, FF Search Informer should be removed from your Microsoft Edge browser. To stop unwanted ads and pop-ups from showing up while you browse the web, you have to uninstall suspicious extensions and reset Mozilla Firefox. Here, select FF Search Informer and other questionable plugins. Click Remove to delete these entries. Now you will see Reset Firefox to its default state message with Reset Firefox button. Click this button for several times and complete FF Search Informer removal. Here, select FF Search Informer and other malicious plugins and select trash icon to delete these entries. Click Reset to confirm this action and complete FF Search Informer removal. Here, select Extensions and look for FF Search Informer or other suspicious entries. Click on the Uninstall button to get rid each of them. Now you will see a detailed dialog window filled with reset options. All of those options are usually checked, but you can specify which of them you want to reset. Click the Reset button to complete FF Search Informer removal process. ^ 6 Different Types Of Computer Viruses You Need To Be Careful About. OnlineCmag. Latest technology news and discussions. ^ Dann Albright. What Are Supercookies, and Why Are They Dangerous?. MakeUseOf. The guide in modern tech. This entry was posted on 2018-02-02 at 05:10 and is filed under Adware, Viruses. You can quickly scan the QR code with your mobile device and have FF Search Informer manual removal instructions right in your pocket. How did you remove FF Search Informer?